With twinkling lights, colourful decor and festive outfits planned for this season of light, love and joy – make your accessories stand out as well. We’re crushing on these Flying Fish accessories that will add chic style, pizzazz and glamour to your outfit and make this festive season even more special. This beautiful Mudra ring is perfect for any Indo-Western outfit, with delicate detailing and a floral design that adds a beautiful glint to your look. Made with sterling silver, the 18k gold plating adds a lovely vibe to your entire outfit and will make sure you slay it at every occasion. Add a carefree, childlike spirit to your look with this pinwheel necklace and make sure you become the center of attention with this bold, yet delicate design. It’s perfect if you’re looking for a distinctive look and we think this one’s versatile and ideal for any function. ..And we don’t mean just at a cards party! This sterling silver bracelet gives a vintage charm to any outfit and the delicate chains make it an appealing addition to any #OOTD. 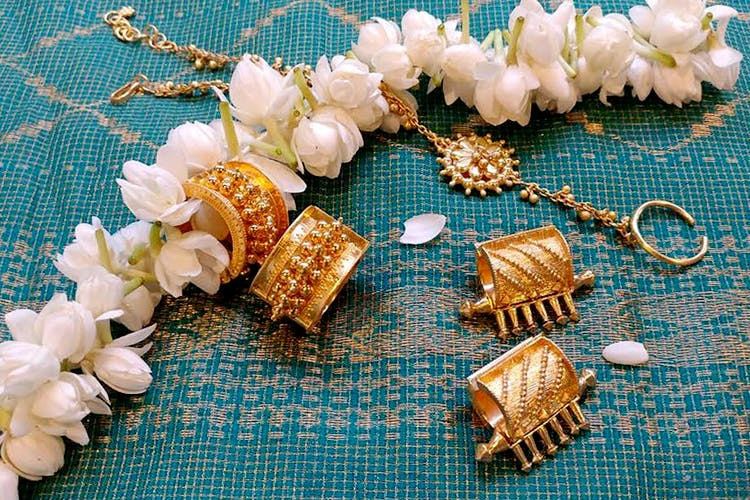 With 18k gold plating, take your love for florals to a whole new level and accessorize your long kurtas and shararas with this beautiful accessory. A messy updo or a simple bun is a style statement we all make with our outfits or during celebrations, and for that, you must get this gorgeous bun pin that’ll add a spark of vibrancy to your tresses. With the star anise design, this is both cute and chic and will definitely get you feeling more festive. This beautiful nose pin from Flying Fish is both delicate and alluring. Perfect if you’re looking to add a quick dash of colour to your look, the gold plating brings a hint of elegance to any outfit. Feeling inspired to shop? With online ordering and delivery within seven days, start planning your festive wardrobe now and get these stunning accessories from Flying Fish to complete your look. With earrings, necklaces, toe rings, nose pins, bracelets and more, you’ll be spoiled for choice with their ethnic yet contemporary design. Check out their website now. Follow them on Facebook and Instagram for more exciting updates and information.